Worcester was enumerated in the 1900 Arena, Iowa Co., WI, federal census. He was a farmer, age 42, single. Also in the household was his mother Ann and sister Lulu. Worcester was enumerated in the 1910 Arena, Iowa Co., WI, federal census. He was a farmer age 51, single. Also in the household was sister Lulu, age 29 single. Worcester was enumerated in the 1920 Arena, Iowa Co., WI, federal census. He was 65 and single. Sister Lulu was also in the household; 39 and single. John and Bessie were enumerated in the 1900 Beotia, Spink Co., SD, federal census, ED 304, page 9A. He was a farmer age 42, she was 37; they had been married 15 years and had 6 children. Children in the household were Edna 14, Harry 11, Vera 7, Roy 5, Phillip 2 and Verna 8 months. [S484] Mazomanie Sickle, 20 Sept 1929. At the time of her brother John's death in September 1929, Florence was living in Millette, SD. Probably the "Elira L" Blake, wife of George Blake enumerated in the 1900 Millette, Spink Co., SD, federal census. Wouldn't otherwise think so but sister-in-law Nettie E. Coutts, widowed was also in the household. Both "Elira" and Nettie were born in WI, father born in NY. George Holcombe was born on 10 December 1862 at Dover, WI.1,2 He was the son of David Holcombe and Annie Appleby.1 George Holcombe died on 25 July 1937 at Mazomaine, Dane Co., WI, at age 74.2 He was buried on 28 July 1937 at Mazomanie Cemetery, Mazomaine, Dane Co., WI. George H. Holcomb died Sunday at the Holcomb farm west of this vilalge, at the age of 64 years, 7 months. 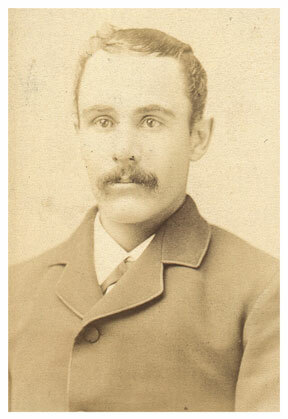 He was the son of David and Alma Holcomb and was born December 10, 1862 in the town of Dover. He received his schooling in the Mazomanie schools and taught for a while in the country school near Arena an dMazomanie. He became a student in Valparaiso, Ind. where he graduated in 1901. He went to Rock Island, Ill, then to Washington D. C. where for 34 years he was employed by the U. S. Treasury Department. He retired four years ago and had been living with his sister, Miss Lulu, on the farm. Survivors are two brothers Frank and Willis of Mazomanie; two sisters Miss Lulu of Mazomanie, and Mrs. Nettie Coutls, Minneapolis, Min. Six brothers and sisters preceded him in death. Services were held Wednesday at the Mazomanie M. E. church with Rev. Edward Sachtjen officiating. Burial in the Mazomanie cemetery. [S484] Mazomanie Sickle, 29 July 1937. Jannette Holcombe also went by the name of Nettie Ella Holcombe. She was born in August 1867 at WI.1 She was the daughter of David Holcombe and Annie Appleby.1 Jannette Holcombe married Clarence Lincoln Coutts. At the time of her brother John's death in September 1929 Nettie was living in St. Paul, MN. Widow Nettie was enumerated in the household of brother-in-law George Blake in the 1900 census. Willis David Holcombe was also known as William Holcombe. 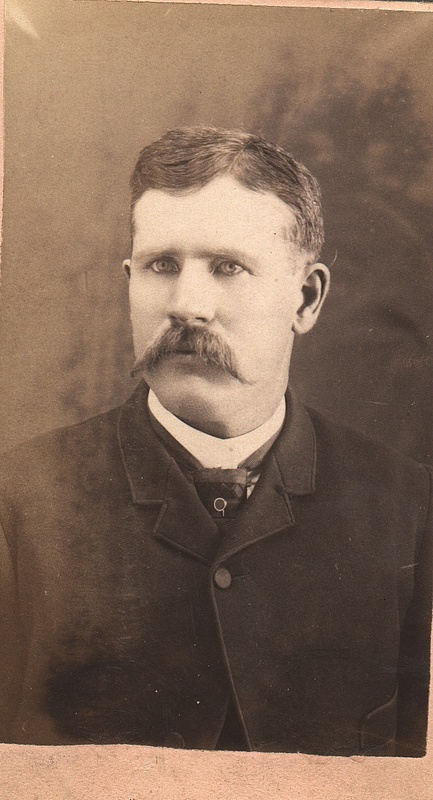 He was born on 10 June 1870 at WI.1 He was the son of David Holcombe and Annie Appleby.1 Willis David Holcombe married Hattie May Brown on 11 March 1897. Willis David Holcombe died on 18 January 1942 at Mazomaine, Dane Co., WI, at age 71. He was buried on 22 January 1942 at Mazomanie Cemetery, Mazomaine, Dane Co., WI. Willis and May were enumerated in the 1900 Mazomanie, Dane Co., WI, federal census. He was a farmer age 29, she was 27. Children in the household were Virgil 2, and Harold 1 month. Willis and May were enumerated in the 1910 Mazomanie, Dane Co., WI, federal census, ED 76. He was a farmer age 38, born in WI; she was 37, born in WI. Children in the household were Virgil 11, Harold 9, and Garth 6. Willis and May were enumerated in the 1920 Mazomanie, Dane Co., WI federal census, ED 68. He was a farmer age 48, she was 46. Children in the household were Virgil 21, and Garth 16. Willis and Hattie May were enumerated in the 1930 Mazomanie, Dane Co., WI, federal census, ED 55. He was a coal dealer, age 59; she was 56. There were no children in the household; Willis' mother Harriett, age 79, was in the household. Willis David Holcomb, son of Mr. and Mrs. David Holcomb, was bornJune 10, 1870 in the old town of Dover and died at his home in Mazomanie, Sunday, January 18, 1942, at the age of 71 years. He spent his young manhood years at the old home. At the age of twenty-one he went to South Dakota where he remained for nearly two years. 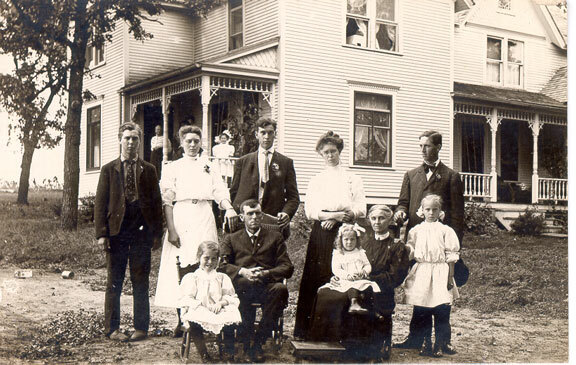 He returned to Wisconsin and on March 11, 1897, was married to Miss May Brown of Dover. To this union were born, Virgil of San Diego, California; Garth of Mazomanie, Wis; and Harold, who preceded him in death twenty-six years ago. Soon after marriage they took over his wife's fathers farm, where they lived until seventeen years ago when they moved to their present home in the village of Mazomanie. He joined the Methodist church July 9th 1922. He was an official of the church for many years. He leaves to mourn his loss his wife, two sons, and four grandchildren. One brother Frank of Mazomanie, and a sister, Mrs. Nettie Coutis, and many friends. Funeral services were held Thursday at 1:30 p.m. from the homeand 2:00 p.m. from the Methodist church with Rev. E.G. Coontz of Baraboo officiating, assisted by Rev. Vaughan, pastor of the church.The remains were placed in a vault and burial will be made later in the family lot in the Mazomanie cemetery. At the time of his brother John's death in September 1929, Ernest was living in Minneapolis. Ernest and Lucy were enumerated in the 1930 Minneapolis, Hennepin Co., MN, federal census. He was a steam fitter for the RR, age 52, she was 49. 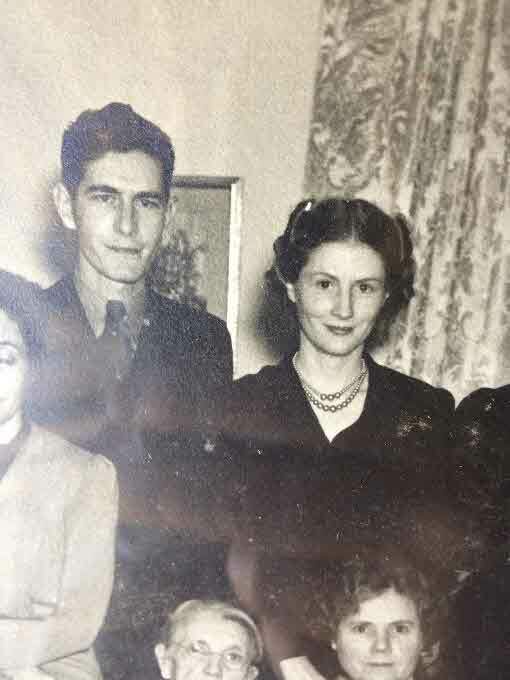 Daughter ruth Parker, age 20, and her husband, David Parker, age 23, were also in the household. Julia married her cousin, John, son of Worcester Holcomb, in 1855. they lived near Mazomanie, Wis., where he died in 1872. She then returned to her father's home in La Grange where she reared her three children. [S613] LaGrange Ladies' Aid Society, LaGrange Pioneers. Jewel Wolfe was born circa 1911.1 She married Harry Claude Moore Jr., son of Harry Claude Moore and Valera Mae Chappell, on 18 October 1930 at Bryan Co., OK.1 Jewel Wolfe and Harry Claude Moore Jr. were divorced in August 1931. There is also a marriage recorded in Ellis Co., TX, on 15 Oct 1930 of Jewel to H. C. Moore; perhaps a license application. [S336] Ancestry.com, Ancestry.com. Oklahoma, County Marriage Records, 1890-1995 [database on-line]. Lehi, UT, USA: Ancestry.com Operations, Inc., 2016. Child of Maurine Garrett and Harry Claude Moore Jr.
[S807] Find A Grave, online http://www.findagrave.com, Find A Grave, database and images (https://www.findagrave.com : accessed 04 June 2018), memorial page for Maurine Garrett Moore (17 Nov 1911–17 Dec 1988), Find A Grave Memorial no. 77702097, citing Faulkenberry Cemetery, Groesbeck, Limestone County, Texas, USA ; Maintained by LADONNA GREER COLLETT (contributor 46996248) . Terry Holcombe was born circa 1805. He was the son of Salmon Holcombe and Phebe Terry. Terry and family are placed here only because he is enumerated next to Salmon in the 1840 Hastiings, Oswego Co., NY census and because his first name is the same as Solomon's wife's maiden name. Also in the household is one female 30-40, one additional male 5-10 and another female 5-10. Allen and Amelia were enumerated in the 1850 Hastings, Oswego Co., NY, federal census. He was a farmer age 33, born in NY; she was 26 born in NY. Children in the household were Augusta 6, Imogene 5, and Samuel 2. Allen and Amelia were enumerated in the 1870 Hastings, Oswego Co., NY, federal census. He was a farmer, age 52, she was 46. Children in the household were Albertine 19, Estella 16, and Horton 14. Jabez and Polly were enumerated in the 1850 Italy, Yates Co., NY, federal census. He was a farmer age 57, she was 55, both born in NY. Also in the household were Harmon 26, and Laura 27. Jabez and Mary were enumerated in the 1860 Italy, Yates Co., NY, federal census, page 25. He was a farmer. Next door, in a separate household was Harmon 36, and Laura 40, with children Maria 8, and Francis 6. [S461] Kathy McConnell DeFoster, "Hannah Holcombe," e-mail to James H. Holcombe, 10 October 2003. Children of Mary Beebe and Jabez Gillett Jr.
Phebe was enumerated in the 1850 Canandaigua, Ontario Co., NY, federal census. She was 55. Also in the household was Pascal, age 21. Seymour and Maria were enumerated in the 1850 Naples, Ontario Co., NY, federal census (stamped page 27). He was a farmer age 50, she was 39. Children in the household were Seymour 20, Louisa 19, Joel 18, Horace 16, Milo 13, Betsy 11, Sarah 9, William 5, and Martha 1. Seymour and Polly M. were enumerated in the 1880 Naples, Ontario Co., NY, federal census. He was a farmer age 84, she was 69. Children in the household were Milo 43, George 16, Seymour 15, and Rosalia 14. George, Seymour and Rosalia appear to be grandchildren. Rosina was enumerated in the 1850 Italy, Yates Co., NY, federal census. She was 42. Children in the household were Phebe 20, Joseph G. 16, Ira A. 12, Cynthia R. 9, Laura C. 8, Rhoda J. 5, and Lydia A. 3. [S377] Coralee Griswold Griswold 6 & 7 Vol 1, Page 297. [S244] John T. Fitch, James Fitch Volume One, Page 114. [S244] John T. Fitch, James Fitch Volume One, Page 45. Fitch's notes are important. Anna apparently delivered son James before nine months had elapsed since her marriage to Hezekiah, if they were married at all at the time. She confessed her sin of fornication, renewed her covenant and submitted to discipline. [S244] John T. Fitch, James Fitch Volume One, Page 17. Elder Jonathan Brewster was born on 12 August 1593 at Scrooby, Nottinghamshire, England. He was the son of Elder William Brewster and Mary (?) Elder Jonathan Brewster married Lucretia Oldham on 10 April 1624 at Plymouth Colony, MA. Elder Jonathan Brewster died on 7 August 1659 at New London, New London Co., CT, at age 65. [S615] The Society of Mayflower Descendants, William Brewster, 75930. Lucretia Oldham was born on 14 January 1599/0 at England. She married Elder Jonathan Brewster, son of Elder William Brewster and Mary (? ), on 10 April 1624 at Plymouth Colony, MA. William was a Pilgrim colonist leader and preacher born in Doncaster, England and raised in Scrooby, in north Nottinghamshire, who reached what became the Plymouth Colony in the Mayflower in 1620. He was accompanied by his wife, Mary Brewster, and his sons, Love Brewster and Wrestling Brewster. Son Jonathan joined the family in November 1621, arriving at Plymouth on the ship Fortune, and daughters Patience and Fear arrived in July 1623 aboard the Anne. [S792] Barbara Lambert Merrick, Elder William Brewster, page 1. [S465] The General Society of Mayflower Descendants, William Brewster, 68,676. [S792] Barbara Lambert Merrick, Elder William Brewster, page 34. [S404] John T. Fitch, James Fitch Volume Two, Page 77. [S404] John T. Fitch, James Fitch Volume Two, Page 78. Hoel and Saloma were enumerated in the 1850 Granger, Medina Co., OH, federal census (stamped page 344). He was a farmer age 47, born in NY; she was 44, also born in NY. Children in the family, all born in Ohio, were Nathan 20, Emily 18, Hannah 16, Lorenzo (?) 13, Nancy 11, Lydia 9, Jeremiah 6, and Julius 4. Howell and Saloma were enumerated in the 1860 Granger, Medina Co., OH, federal census. He was a farmer age 57, she was 53. Children in the household were Milton 23, Lydia 20, Judson 16, and Julius 14. Hoel and Salome were enumerated in the 1870 Granger, Medina Co., OH, federal census, page 4. He was a farmer age 67, she was 64. Children in the household were Hannah 34, and Julius 23. Hoel and Saloma wre enumerated in the 1880 Granger, Medina Co., OH, federal census. He was a farmer age 77, she was 75. Children in the household were Hannah 46, and Julius C. 34. Also enumerated was daughter-in-law Louisa Hatch, age 38, presumably Julius' wife. Judson and Celia were enumerated in the 1870 Granger, Medina Co., OH, federal census. They wre living in the household of 74 year-old Isaiah Hall. Judson was a farmer, age 25, she was 22. The only child in the household was Ada, 4 months. Judson and Angelia were enumerated in the 1880 Granger, Medina Co., OH, federal census, page 240A. He was a farmer age 36, she was 32. Children in the household were Ada 10, Edda S. 8, and Claude 3.Father-in-law Isaiah Hall age 84, was also in the household. Seymour N. and Phoebe were enumerated in the 1850 Canandaigua, Ontario Co., NY, federal census. He was a farmer, age 34; she was 31. Children in the household were Letitia 5, and Martha E. 3.